The main goal for this book is to help the readers build a solid foundation of both basic and advanced conceptual knowledge to prepare for the American Board of Pathology (ABP) certification exam in Transfusion Medicine. This book is not intended to be a substitute for textbooks, original research or review articles, and/or clinical training. Further, since the field of medicine, both from a scientific and regulatory perspective, rapidly changes, the readers are advised to continuously update their knowledge by attending national meetings and reading clinical journals. To equip the readers with the basic knowledge in critical reading and data analysis, which is an essential skill in daily medical practice, a novel chapter titled “Data Interpretation in Laboratory Medicine” was included in this book. In this chapter, the readers are asked to make logical conclusions based on the given data and/or statistical results. Moreover, there is also a chapter on “Practical Calculations in Transfusion Medicine, Apheresis, and Hemostasis” to help consolidate all the necessary formulas commonly used in daily practice for easy reference. These chapters are unique to our book and will not be found in any other currently on the market. All of the questions in this book were originally created by the authors of each chapter. Each question can either be standalone or part of a case scenario representing challenge cases in Transfusion Medicine, Apheresis, and Hemostasis. These questions often represent both rare and common clinical scenarios that the authors have seen during their clinical practice. Each question is then followed by 5 possible answers, with only one being correct (or the best answer). After the question, there is a conceptual explanation followed by a more factual explanation of the right and wrong answers. We gave the individual authors the freedom to choose how they explained the wrong answer choices. Some authors chose to be more direct (e.g. Answer A is incorrect because…), while other authors chose a more conversational style (e.g. Human resources (answer A) includes staffing, selection, orientation, training, and competency assessment of employees). This format is designed to help the student linking the conceptual and factual knowledge together to form a solid foundation for use in clinical practice. At the end of each chapter, there is a list of articles and textbooks that will prove useful to the motivated student who wishes to become an expert in the field. Another special feature to our textbook is the presence of a pre-test and post-test, which are provided to help the readers with self-assessment. As stated above, the main focus of this book is to help the readers preparing for the ABP certification exam in Transfusion Medicine. 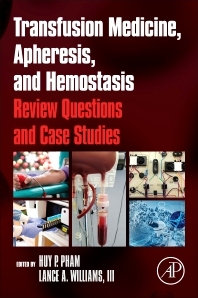 However, due to the interdisciplinary nature of the field of Transfusion Medicine, Apheresis, and Hemostasis, we believe that this book is also beneficial to and can be used by all clinicians involved in the management of complex transfusion, apheresis, and hemostasis issues, such as hematologists, anesthesiologists, surgeons, and critical care physicians. We further believe that it is a helpful guide for these specialists to prepare for their own specialty certification exam, when the topics are related to Transfusion Medicine, Apheresis, and Hemostasis. Dr. Pham is currently an Assistant Professor in the Department of Pathology, Division of Laboratory Medicine and serves as the Medical Director of Apheresis at the University of Alabama at Birmingham. He also regularly attends clinical service and provides resident/fellow teaching in the Transfusion Medicine, Apheresis, and Hemostasis. With research interests in statistics, mathematical modeling, and health economics in additional to the clinical aspects of the field, he has been the lead author or senior author for many original research and review articles as well as book chapters on different topics in Transfusion Medicine, Hemostasis, Apheresis, and Cellular Therapy. Nationally, he serves on multiple professional organization committees to provide guidance for clinical practice and research direction for advancing the field. Dr. Pham is board certified in both Clinical Pathology and Transfusion Medicine. Dr. Pham received his BS with high honors in bioengineering from the University of California, Berkeley, MD from the Chicago Medical School, and MPH in Biostatistics from Columbia University. He completed his Clinical Pathology residency at the New York-Presbyterian Hospital – Columbia University Medical Center and Transfusion Medicine fellowship training at the joint program between the New York Blood Center and Columbia University Medical Center. Dr. Williams is currently an Assistant Professor in the Department of Pathology, Division of Laboratory Medicine and serves as the Medical Director of Hemostasis Laboratory at the University of Alabama at Birmingham. He is also the Director of Transfusion Medicine for the Community Pathology Practice Program, which encompasses 5 hospitals throughout Alabama. Dr. Williams received his BS with high honors in Biology from Longwood University and his MD with honors from Ross University. He completed residency training at East Carolina University and two fellowships – Transfusion Medicine at Yale University and Hematopathology at Virginia Commonwealth University. Dr. Williams is an award-winning teacher, known for his innovative teaching methods and his dedication to elevating students of all levels. His publications include original research articles, review articles, and books, including Quick Guide to Transfusion Medicine, 2nd edition. Nationally, he is known as an engaging and knowledgeable speaker and he serves on many committees committed to advancing the science of Transfusion Medicine, Apheresis, and Hemostasis.